Whenever someone says white water rafting in India, we all know what place can quench their thirst adventure. 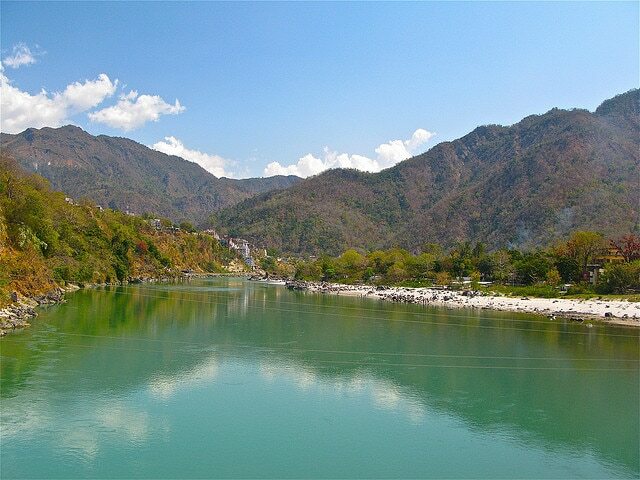 Rishikesh is a municipal hill town located in the Dehradun district in Uttarakhand. The town is located in the Himalayan foothills and also one of the most revered tourist places for the Hindus. The name ‘Rishikesh’ is derived from the Hindu deity Lord Vishnu and also translates to ‘lord of the senses’. The place is also related to Lord Agni and is also called Agni Teertha which was once used by the fire god Agni to pray for the forgiveness of his sins. Rishikesh is also known for sharing its banks with the holy river Ganges which passes through the Shivalik Mountains and is just an hour’s drive away from Haridwar. While the average elevation of Rishikesh doesn’t allow it to be a proper hill station but its location in the Himalayan Foothills, lets it enjoy a similarly mild weather. Due to its low altitude in the Himalayan foothills, Rishikesh enjoys a climate that is unlike any other hill station in India. The summers start from March end and continue till the month of June. The temperatures can go up to 38 degrees Celsius during summers so light cotton clothes are advised. The evenings however are mildly cool and provide a much needed break from the sun. Rishikesh sees some really heavy monsoons that start from the month of July. The average precipitation during the months of July and August is around 490 mm so one needs to watch out for the heavy rain falls. The winter season in Rishikesh is characterized by a mild yet amazing winter that starts from the month of November and lasts till the end of February. The temperatures never go beyond 20 degrees Celsius, and hardly go below 2 degrees. The only season Rishikesh should be avoided is during the monsoons. The place is full with a lot of scenic beauty during the rainy season but landslides and flooding of the river is common and visitors should be extremely careful during this season. The best season to visit Rishikesh is late September till February. Unlike other hill stations which are visited by tourists during the summers, Rishikesh is best visited during the winters when the climate is the most pleasant and the scenery can be enjoyed without the scorching sun or the fear of heavy rainfall. Rishikesh being one of the most famous pilgrim spots for the Hindus is visited by thousands of tourists each year. Apart from the scenic beauty there are several other `. Ever since the famous visit of the Beatles in the 70s, Rishikesh is famous for its meditation and Yoga Ashrams and the various Ghats of the holy river Ganges. Apart from the spiritual and religious attractions Rishikesh is also known as one of the best spots for rafting and bungee jumping with professional bungee jumping courses from New Zealand. Rishikesh is also a great place if you want to enjoy camping near the shores. Trekking, rock climbing, rappelling, cliff jumping are the other adventure sports that are offered in Rishikesh. Triveni Ghat, Lakshman Jhula, Beatles Ashram, Trayambakeshwar Temple, Ayurveda Mandir are the various spots that must be visited to get the best out of the spiritual experience that Rishikesh is. Rishikesh being an important pilgrim destination is accessible via all major cities in Uttarakhand and India. Rishikesh is really close to the Dehradun airport which is connected via flights from New Delhi and other major airports around the country. Flights are also frequently available from Lucknow to Rishikesh. If you want to travel to Rishikesh via roads then it is just a 6-7 hours journey from Delhi. You can hire taxis or cabs from Delhi to Rishikesh which are easily available during most of the year. Road travel by car should be avoided during monsoons due to proximity of landslides. Reaching Rishikesh by train is also fairly easy as there are around 3-4 direct trains from Haridwar. This is especially helpful during the melas when bus routes are busy and trains usually run empty. Buses to Rishikesh are available from Delhi. There are several bus agencies in Rishikesh around the Lakshman Jhula area. Getting around in Rishikesh is usually done via auto rickshaws. Most of the town is pretty walk able and the best way to enjoy the town’s attractions is on foot. Being visited by thousands of tourists all year round, Rishikesh has plenty of accommodation facilities. The place is filled with budget hotels and a few mid ranged hotels. There are several luxury hotels near the Lakshman Jhula area but bookings need to be done in advance, especially during the festive season.